HELP! I found a baby, or a hurt, robin! Why are baby robins ugly at first? Why has the mother stopped sitting on the nest at night? When a nestling falls from the nest, can I put it back? Should I rescue an orphaned robin? I'm raising a baby robin. What do I need to know? I have a baby robin with a deformed beak. What should I do? My male robin was killed. Will the female find another mate? Q. HELP! I found a baby, or a hurt, robin! Q. Why are baby robins ugly at first? We have a robin nest outside our kitchen window that my small children and I have been watching for weeks, since the mother started building. Yesterday the beautiful blue eggs finally hatched, and when my children saw the babies, they were horrified at how ugly they are! They've seen how adorable and fluffy baby ducksand chickens are, but these robins don't look anything like that! How long will it take until they fluff out and look cute? A. The reason ducklings and chicks are cuter than newly hatched robins is that they are actually older than robins when they hatch out! Most mother ducks and birds related to chickens nest on the ground, and lay a dozen or so eggs. 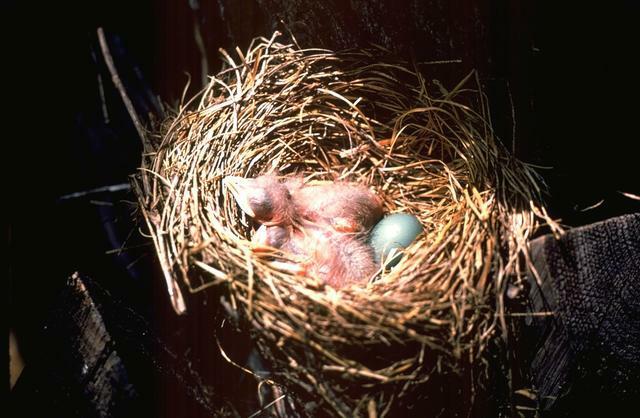 If those babies hatched out helpless like robins, their calls and movements could quickly attract predators. It's much easier and safer for the female to quietly enter and leave the nest alone, and incubate for a few weeks longer, until the babies are strong enough to follow her out of the nest as soon as they hatch. It would be very difficult for a mother duck or chicken to find and bring enough food for so many babies all by herself, and male ducks and roosters simply don't know how to help care for babies. So upon hatching, ducklings and chicks, which are precocial species, immediately fluff out and follow their mother, who leads them to food and teaches them where to hide when danger approaches. They are well-developed enough to eat by themselves right from the start. Baby robins may be undeveloped, with very few feathers and bulging eyes at first, but beauty is in the eye of the beholder. Their parents think they're the most beautiful, wonderful babies in the world! And looking at them, you can learn a lot about birds. The first few days, you can see how enormous bird eyes actually are beneath their transparent skin and translucent skull. When their feathers grow in, we see only a tiny bit of those huge eyes. Baby bird skin is clear enough to allow us to see some of their internal organs. You can see the greenish gall bladder (which holds bile produced in the liver to help them digest fat juicy worms!) the purplish-red liver, and the orange yolk-sac. As that grows smaller and the nestling grows bigger, you might notice some bright yellow areas here and there-those are fat deposits. Down feathers grow in fairly quickly to make the nestlings a little fluffy, so they can stay warm when their mother isn't incubating. Watch how their body feathers grow in. Each one appears to be a very tiny cylinder at first, like a tiny drinking straw, but that smooth outer case, called the "sheath," crumbles to allow the developing feather to open up. It takes only fourteen days or so for these tiny, unformed little creatures to grow a full body covering of feathers, with bright and sparkling eyes, able to hop and flutter their wings. Enjoy watching this amazing transformation! I'm trying to figure out if a nest of robins has been abandoned. Can you tell if when the babies are bigger the mother or father stays on the nest at night or do they roost elsewhere? For the past few nights I've notice that the babies are alone (I can them see out of a window) and haven't seen an adult around them for several days. Should I be concerned? A. By the time the babies are about a week old, the nest is getting crowded, and the babies are capable of keeping themselves warm, all snuggled together. At this point the mother robin starts sleeping on a tree branch again. If she is a wary mother, you might not see her feeding the young because robins are so fearful of alerting predators that they simply don't go near the nest if they notice anyone observing them. Q. When a nestling falls from the nest, can I put it back? After a big windstorm, I found two very small baby robins on the ground under their nest. I'm afraid if I pick them up, the smell of my hands will make their parents abandon them. Can I handle them with gloves, or is there nothing I can do? Q. Should I rescue an orphaned robin? Help! I found a baby robin in my yard and think the mother and father were both killed. What should I do? A. Imagine being the mother of four or five toddlers set loose in a toy store. A family of baby robins usually all fledge on about the same day, and suddenly the babies are investigating the big, wonderful world, stretching their wings and exercising their hopping muscles, going every which way. The parents must continue to find food for all of them, and find them one by one to feed them. Baby robins are defenseless, and if a parent spots you near one, it instinctively trusts that the baby has a better chance of not being noticed if the parent stays away. So it flies off to feed another of the brood. If the baby calls out of hunger, the parents usually come very quickly. The family stays together for at least 3 weeks until the babies are independent. If you find a baby robin, you are doing the bird and its parents a horrible disservice if you pick it up without being CERTAIN that the parents are dead. It is hard for a bird to survive to adulthood, and it has the best chance if its parents can teach it all the skills it needs for avoiding predators, finding food, and recognizing the safest areas for roosting at night. Parent robins also help their young develop the social skills they'll need when they flock with other robins during migration and winter. If you have proof that the parents are dead, or the baby robin is being attacked, and absolutely needs to be rescued, try to get it to a licensed rehabilitator as soon as possible. Meanwhile, you can feed it earthworms, mealworms, bits of strawberry, blueberry, cherry, raspberry, and other fruits, and hand-feeding mixtures available at pet shops for hand-rearing baby parrots and cockatiels. Robins need food from the time the sun rises until it sets each day, and should be fed every 10-20 minutes during that time, but unlike mammals, robins never need overnight feedings. If they're indoors for any time, they need vitamin supplements that include Vitamin D3--bird vitamins are available in most pet shops. Q. I'm raising a baby robin. What do I need to know? My husband and I have been raising this bird for two weeks. When we found the bird, he couldn't even perch. Since then, he is capable of short flights, and can now take food without it being put in his mouth. At the advice of volunteers, I have fed him every hour, from Neonate to 3-4 worms per hour. After work, I take him to our garden and compost pile to learn about looking for food. My questions are, should this frequency be continued? Are there insects I should not introduce him to? Does he instinctively know to avoid dogs? (I have three dogs} Do all robins migrate? Will he know to migrate, build a nest, etc.? When or should we encourage him to leave? A. Your baby should be fed as much and as often as he likes, but now he should also be kept outside, loose, as much as possible. He will make exploratory flights away, but will come back for feeding. He will figure out a lot about food all by himself. He does NOT instinctively know that dogs are dangerous, and if your dogs are nice to him, it might endanger him the first time he finds a not-so-friendly dog. But if he survives his first encounter with an aggressive dog, he'll master that lesson instantly. You will quickly find that as he masters finding berries and worms for himself, he will grow less and less dependent on the food you offer, so don't worry about making him dependent, as long as you give him the freedom that his own parents would give during his critical time of learning and exploration. If you trust him to learn natural skills while you protect him, little by little he's going to get more wild. He will start associating with robins on his own, grow restless in fall, instinctively join up with other robins, and take his cues from them about migration. I rescued...or so I thought...a baby Robin who fell out of the nest at a friends house. I tried to find the nest but couldn't and since he has cats who frequently kill birds I took her home. It has been 2 weeks and she is now able to fly but will not pick up food on her own. I put out a tray of small bits of berries and fruit but no go. I tried some bird seed which seems like some of it has been eaten. She still insists on being hand feed worms. I feed about every 2 hours 2 worms cut in halves. She is quite demanding and comes looking for me in the house to be fed! When I come home she flies at me and has even landed on my head. I don't want her to be a pet but am afraid to turn her loose for fear she will not survive. If I take her back to the area where I found her and turn her loose will her parents recognize her and accept her? Will she know to feed herself? Do Robins stay in the area where they are born or do they immediately move on? Attached is a pic of her....by looks is she old enough to be on her own? Please hurry as I feel each day goes on I do more damage. A. This baby robin is clearly not ready to be on her own yet. If you can get it to a wildlife clinic, they will know how to teach it to be wild. One of the reasons that the U.S. Fish and Wildlife Service requires people to have a license to rehabilitate baby birds is that it requires training to ensure that the robin gets proper nutrition during this vulnerable stage, when proper growth of bones and feathers is critical, and to ensure that the baby learns all the life skills it will need to survive in the wild. If you don't have a wildlife clinic near you, you'll need to do several things to ensure that this baby has a good chance of survival. 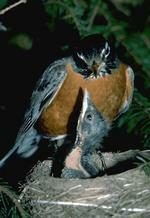 Robins do not feed their babies a diet of 100% worms. The babies get a variety of insects and fruits as well. To mimic this diet in captivity, a rehabber feeds primarily mealworms (larvae of beetles, which can be purchased at bait shops, pet shops, some bird feeding shops, and at mail order places such as Grubco and Rainbow Mealworms. This diet is supplemented with earthworms, a baby cockatiel and parrot hand-feeding mixture available at petshops, and fruits and berries. In nature, the parent robins are constantly searching for food and feeding their babies during daylight hours. A baby robin should be fed as much as it can eat at least every half hour from sunrise to sunset. You can take a 2-3 hour break maybe once a day. From the photo, this baby is a fledgling. At this point in a wild robin's life, it has jumped from the nest several days ago, and hops around exploring the big world. Little by little it learns what foods it can eat, but it is still getting most of its food from its parents, who are also teaching it to avoid predators and other dangers. Robins at this stage of development are very vulnerable to cats, which are far more numerous than any natural predators could be and survive, which is why cats belong indoors. (See the American Bird Conservancy's Cats Indoors to learn more.) When a person is raising a baby bird, it's important to allow the baby outdoors during this critical developmental stage. Some people think they're "protecting" a baby robin by keeping it indoors during this period, and then at the point when the baby robin would be independent, setting it free in a park. But this is exactly like keeping a human child in a playpen until she's high school age, and then suddenly kicking her out forever, expecting her to be independent and able to survive on her own. 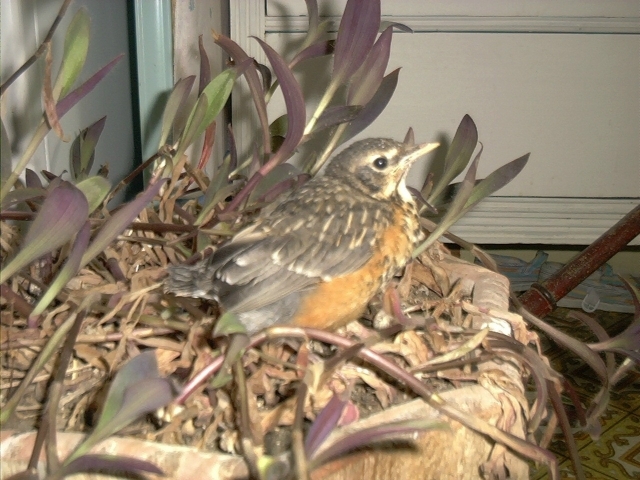 When I was rehabilitating wild birds, I'd let fledgling robins spend most of the day in my backyard. When they were still nestlings, I would whistle whenever I fed them so they'd learn to associate that sound with food. Then, when I took them outdoors, I'd go out every 15 minutes or so to feed them. The first few days, I often had to search them out, but I'd recognize their calls and could find them pretty easily. After a few days, as soon as I walked out the door they'd fly right to me if they were hungry. I'd bring them in at dusk for a few weeks, but little by little they'd be taking less food from me, and one night they'd stop coming in. After a couple of weeks, I'd notice how little food they wanted, and suddenly they'd simply stop approaching me at all. That was when I knew they'd be fine on their own. Q. I have a baby robin with a deformed beak. What should I do? I found a baby robin 4 1/2 weeks ago. He had fallen from his nest and injured his foot...he still is unable to stand up good. The first week I fed him baby food and cat food (puréed ), with an eye dropper. He started opening his mouth and flapping his wings so I started feeding him lunchmeat, baked turkey and gourmet moist cat food, I have since added grapes to his diet. I do add vitamins to his water. But my problem is he cannot eat on his own, he depends on me to feed him....I think his beak is also deformed...his top beak is longer than his bottom beak. He cannot pick food up and flip it back. It gets stuck in the curved part of his top beak. I have tried to teach him to eat on his own, but I do not know if he really cannot eat or he just don't know how...I keep food like grapes, cut up, small slices of the turkey lunch meat, cat food, dog food, lettuce, anything I think he will at least try and eat. Even bread. I just am trying to get him to not be dependent on me for food. I have been feeding him every hour, thirteen hours a day for the last 4 1/2 weeks....can you give me any suggestions on how I might be able to wean him from all the hand feeding, or will he be dependent on me from now on? Is there anything else I can feed him, besides me going out and dig up worms. He is very picky about what he eats, if he don' t like what it taste like, he will refuse to eat it or throw it out of his mouth...but he does love grapes. Also can you explain why he seems to get restless around dusk. He even refuses to eat then. Any information you can give me I would really appreciate. I have grown so attached to this little bird...I want him to live a good happy life. A. I have never seen that situation. Was the beak this way when you found him? Sometimes parent robins drop a deformed baby from the nest--at least I have seen this happen once before. With the injured foot, it's possible the baby had a vitamin deficiency. An alternative explanation is that food stuck on the beak actually kept it from growing properly. If it's possible to take a digital photo of it or to scan a regular photograph, maybe I can tell by seeing what it looks like. Until you can get the bird to a licensed rehabber, I'd cut the feedings in half and leave chopped strawberries, blueberries, bits of apple, raspberries, and/or any other sweet fruits in a shallow dish. Also a few earthworms, which are a basic component of a robin's natural diet. He does require protein. Crumbled hard-boiled egg yolks, canned dog food, and meal worms are the best sources of protein for songbirds when a genuinely natural diet isn't available. Over time, he's supposed to learn to eat by himself. He's much older than fledgling age, and should be doing this on his own already. Again, a licensed rehabber knows how to encourage birds to eat on their own and even how to teach them how in some situations. It sounds though like your bird has a genuine deformity that may make normal living impossible. As far as his evening restlessness goes, he's the age when he should have fledged. Fledgling robins join with their fathers and other robins (and their mothers if they aren't brooding a new nestful of eggs) in nighttime roosts. Your robin must have an instinctual need to fly off and join other robins. Deep in his bones he knows he's a robin and needs to live that robin life as soon as he can manage on his own. Also, there is no need to feed him after the sun goes down. In nature, robins begin feeding at first light, and fly to roosts (with no more feedings for the rest of the day) before sunset. Best of luck with him. I am trying to find out what are the chances for my female robin to find a new mate? Last sad Sunday 2 males flew into my upstairs window fighting over the boundaries for the territory. Both died in my hands within 5 minutes. So sad for me. Now I have a grieving female still defending her place in my garden. She is fighting with others who want to move in. I still feed her a few raisins every day. She stopped looking and softly calling for him now. I hope there is hope for her to find a mate. I miss hearing them sing in the morning. Every garden has one but mine is silent. Hope you have time to let me know about it. A. It sounds like your male robin was a very aggressive one, and your yard must be a really fine habitat for two birds to fight so gravely over it. During the time that robins are establishing territories, many individuals are still migrating. If they find an open territory en route, they often take it over. Also in most healthy bird populations, there are "extra" birds called floaters that wait in the wings for a territory to open up. Floaters in your neighborhood might be timid about entering the yard for a while, if your robin taught them that he was going to attack if they crossed his boundaries. It will take a little time for them to relax and check it out. Meanwhile, robins passing through may well notice an opening and fly right in. Normally females chase other females out, but fairly quickly adapt to a strange male. Q: Is it a bad thing to move a robin's nest? There has been a nest in our yard, and the babies and nest have been constantly falling out of the tree. Will the parents be able to find the babies or should we move the nest back where we found it? A: Is this a robin nest? They tend to fall apart when they fall out of a tree, because the mud crumbles, and so the nest would be difficult to replace. Of course, other nests aren't easy to replace, either. Normally when there are tiny nestlings and a fallen nest, we try to get it back in place by putting it in something like a blueberry basket, and then place that basket sturdily in the tree's branches. This is a good website to bookmark for times when you need assistance for birds in trouble: Wildliferehabber.org Unfortunately, sending an email to any website can't help in an immediate crisis. Q: It’s been three days since I found these baby robins and since then I’ve been giving them wet bread and water. Then yesterday I went online and searched up what to feed baby birds and one of them said canned dog food so since I have a dog I decided to try it because I think they were getting tired of soggy bread. I gave bread to them once and the birds seemed fine and now their droppings are coming out different colors. I just want to know if by giving them about two bites (to each bird,) will it kill them? I’m very unsure of what to do and when I tried to find a near by rehabilitator I found nothing! I would really appreciate your help and advice on what to do.